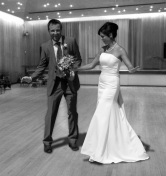 Dancercise offers you the chance to learn a choreographed and personalised dance routine to your chosen wedding song, taught in a private studio or in the comfort of your own house, so that on your wedding day you can surprise your guests with your first dance and make the evening memorable. If you never danced before, don’t worry! We will help you choose your song and dance style and will draw up a first dance lesson plan uniquely tailored to your abilities to develop your skills and confidence right up to your wedding day. Some couples choose a traditional wedding dance (like a Waltz or an American Smooth), while others opt for a more lively one (like a Salsa or a Cha-Cha-Cha) and some couples even decide to go for something fun and original with lots of bumping, grinding and funky moves. Flexible days and times to suit you. "Emily, we just wanted to write a little note to say thank you for all your help (and patience) with our wedding dance in December. You made us both feel so calm and confident throughout our lessons and even though we have two left feet everyone has commented on how impressed they were, you are an excellent teacher and we will definitely be looking to start dance lessons with you again in the near future!